Author(s): Josipa Matić, Lidija-Marija Tumir, Marijana Radić Stojković, Ivo Piantanida. Laboratory for Study of Interactions of Biomacromolecules, Division of Organic Chemistry and Biochemistry, Ruđer Bošković Institute, Zagreb, Croatia. Interactions between DNA/RNA and huge variety of peptides are quite common in nature, controlling vast number of processes. 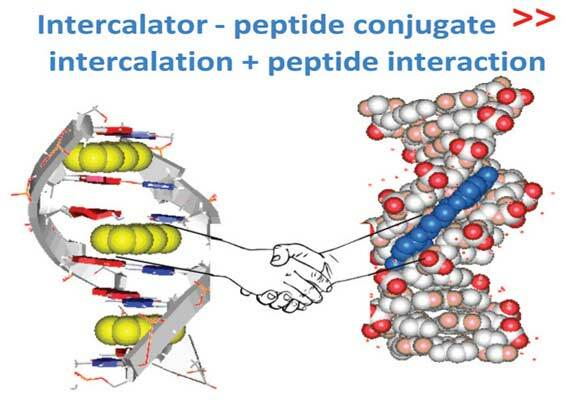 Also, there are several naturally occurring small molecules which contain peptide and DNA intercalator in structure, whereby their biological activity is based on synergistic interactions of both components; for instance bis-intercalator echinomycin. Versatility of synthetic approaches to short peptides allowed their usage as simple recognition units within the DNA or RNA grooves or as backbone carriers for variety of bioactive substituents attached to amino acid side chains, one of very popular examples being PNAs. Such peptide-backbones were also used for synthesis of novel intercalators and poly-intercalators, many of them showing intriguing novel DNA/RNA interacting properties. Keywords: DNA, RNA, peptide, intercalator, fluorescence, DNA-cleavage. Affiliation:Laboratory for Study of Interactions of Biomacromolecules, Division of Organic Chemistry and Biochemistry, Ruđer Bošković Institute, Zagreb, Croatia. Keywords:DNA, RNA, peptide, intercalator, fluorescence, DNA-cleavage. Abstract:Interactions between DNA/RNA and huge variety of peptides are quite common in nature, controlling vast number of processes. Also, there are several naturally occurring small molecules which contain peptide and DNA intercalator in structure, whereby their biological activity is based on synergistic interactions of both components; for instance bis-intercalator echinomycin. Versatility of synthetic approaches to short peptides allowed their usage as simple recognition units within the DNA or RNA grooves or as backbone carriers for variety of bioactive substituents attached to amino acid side chains, one of very popular examples being PNAs. Such peptide-backbones were also used for synthesis of novel intercalators and poly-intercalators, many of them showing intriguing novel DNA/RNA interacting properties.